You will be given a reference e-book to read which has 224 pages And the test will be based on that e-book , you can take final test within 1 year of purchase. What is SAP Enterprise Management? SAP enterprise management refers to the process of using integrated software which comes with a more comprehensive functionality so that an enterprise will get the chance to streamline its entire management process. The SAP software is never difficult to install. In fact, you can install it independently into the SAP ERP system as no direct link is required to complete the installation process. Getting a SAP enterprise management certification can be extremely useful for you as your knowledge in this field can be used in a number of ways. The versatility of the process makes it possible for you to use it at a business unit level, company headquarters, product lines, regional organizational units and any other vital unit in an organization which has its own processes for strategic planning. When attempting to effectively carry out the SAP enterprise management process, you should know that you can utilize either a centralized SAP system or multiple systems that are being linked together. Taking up a SAP enterprise management course will inform you that the entire SAP enterprise management process is known as an analytical application which is structured using five major components namely the business planning and simulation, business consolidation, stakeholder relationship management, business information collection and corporate performance monitoring. SAP enterprise management is also a major help in your attempt to effectively structure business strategies, communicate your major objectives all throughout the organization, consolidate actual data and organizational activities, collect data from either internal and external sources and communicate all the business strategies that you have developed to stakeholders. If generating enough knowledge about the SAP enterprise management process is your major aim, then you should know that Brainmeasures, an online certification company certified by ISO, can provide you with all the information that you need. 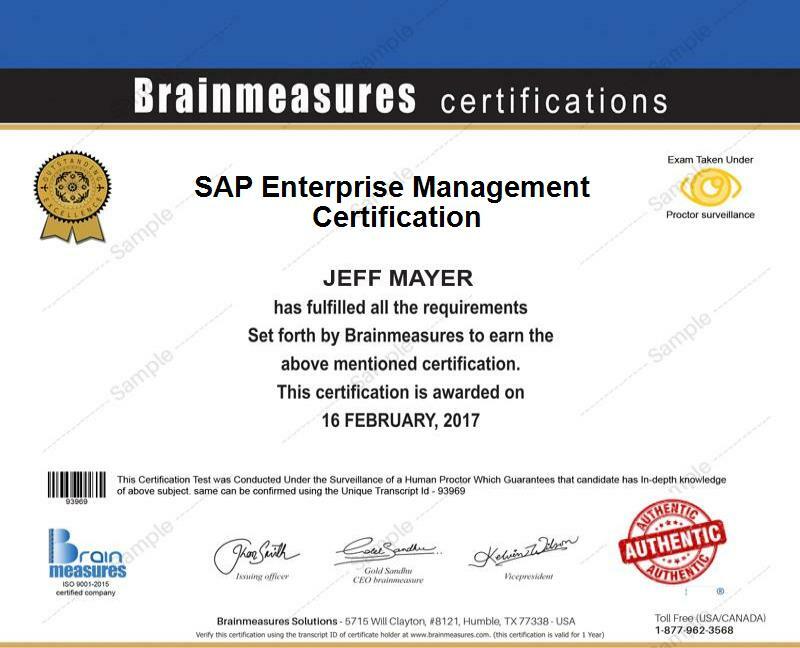 Brainmeasures offers a SAP enterprise management certification program and this aims to give you a detailed background about the process of managing your enterprise with the help of SAP software. This program from Brainmeasures is a reliable one considering the fact that it was expertly developed by professionals and customized to meet the demands of all the individuals who are greatly interested in improving their knowledge about the SAP enterprise management field. You can rely on all the SAP business management information provided in the program since these are all accurate. The program also aims to provide you with the highest level of training so you can instill in yourself the skills needed to become an effective holder of the SAP enterprise management certificate and handle all your responsibilities in a more efficient manner. The SAP enterprise management certification program is suitable for different types of professionals who are working within a business organization. The program works perfectly for individuals and professionals who wish to receive enough background about the major components of the SAP enterprise management process and how they can use this process to improve the performance of a business organization and allow it to achieve success. Working as a SAP enterprise management expert gives you the opportunity of increasing your annual income. You will be earning around $55,000 to $122,000 after receiving your SAP enterprise management certification.